Some fantastic catches this week and a monster brown of 7.8kg being caught in Lake Eucumbene. 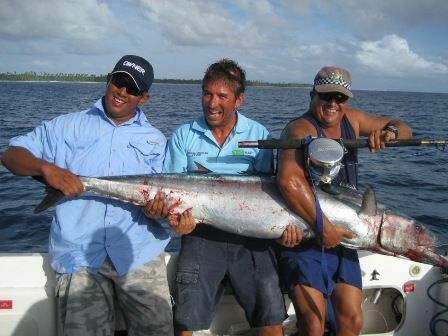 Regular reader of the fishing report and super keen trout angler Harry from Canberra (pictured centre) is having a ball in the Cocos Islands with this 42kg Wahoo being his most recent catch. A bit bigger than your average trout but he still can't wait to get back and up to the mountains again. Top fish Harry! *Remember that from the 1st of May the size and bag limit changes in the Eucumbene and Thredbo Rivers. From May 1 you may only keep ONE fish OVER 50cms per day in these waters. Fisheries will be very active this season in these waters so make sure you stick to these rules and have your fishing licence with you while fishing. 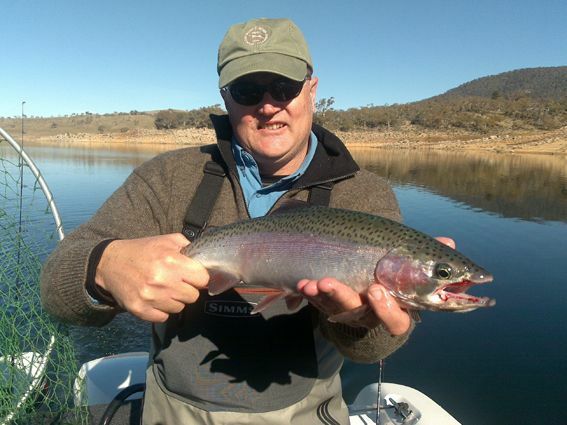 Rivers:- Have been fishing well with the Eucumbene and Thredbo rivers holding good numbers of fish with plenty of rainbows amongst them. Angler numbers have been high and can make the fishing difficult at time. Water levels have been low and clear and this has made fishing challenging for some. Beadhead nymphs seem to be better performers on browns while globugs have been the favourite pattern for the rainbows. Early starts are a key to getting the most out of the rivers at present though on some mornings icing guides are an issue. If you expect to catch a heap of fish starting after 9am, expect to be dissapointed. 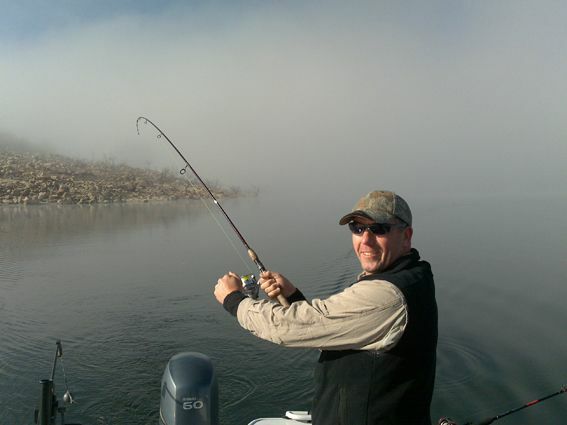 Fishing the harder to access areas will improve your chances greatly. Rain is really need to give a boost to the fish numbers in the Euc and Thredbo so keep an eye on the weather patterns. Other smaller streams in the area are still well worth fishing and are ideal if you want to avoid crowds. 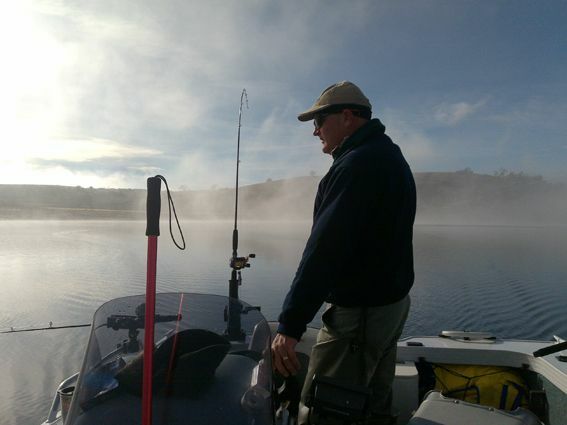 *Canberra Angler, Kieran O'Shannassy had a good, though cold session on Sunday morning catching several fish. Minus eight was a very cool start but by mid morning and despite numbers of anglers on the river he managed to connect with this very respectable 2.5kg brown. He also landed a few rainbows. 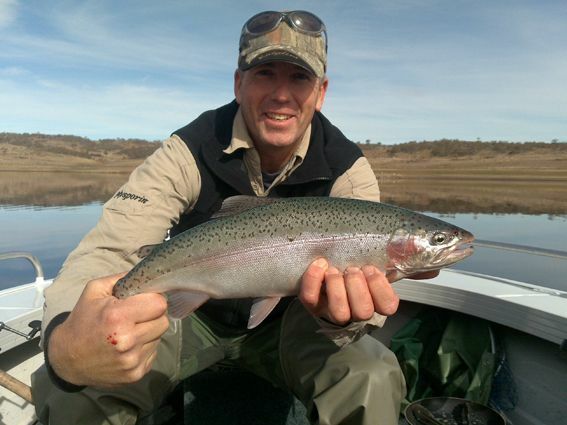 Lake Eucumbene:- Fly reports have been good for those giving it ago this week. Daytime fishing has genereally been the best with the evenings and night time fishing generally quiet. Once again the Buckenderra arm has produced some fantastic rainbows and good numbers both off the bank and in boats. Any small wet or beadhead nymph will be eaten by the hungry rainbows that are in residence in that area. 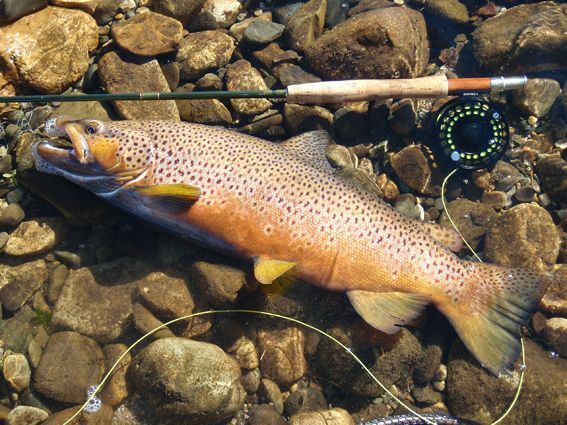 The Angler's Reach and Old Adaminaby areas have been producing a few good browns and some nice rainbows if you can find them. Best flies are wooly buggers, copper johns, taihape ticklers and fuzzy wuzzys. 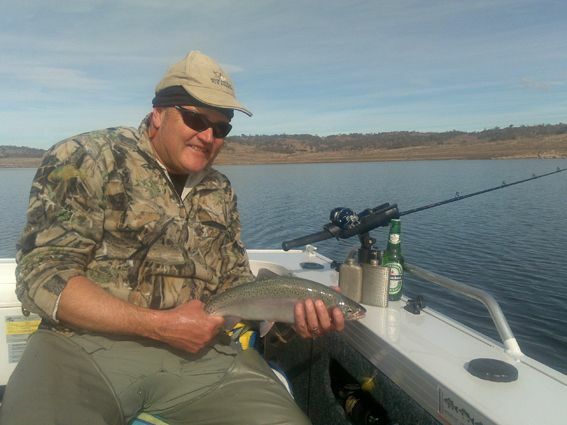 Lake Jindabyne:- Jindabyne reports have been quiet on the fly with the Thredbo river being the popular location for that area at present. Lake Tantangara :- Reports have been quiet from the lake on the fly front. Eucumbene:- Eucumbene trolling reports have been better with some good fish to be had in many of the arms. *The locally made Snowy Minnow has again caught a monster brown in the lake last week. Though no photo has been seen yet a reported 7.8kg brown was caught by Mario's son (Mario makes the Snowy Minnow) in the Angler's Reach area. The fish was photograhed, weighed in the net and then released. What a buzz that would have been. Will try to get a photo ASAP. *Local Paramedics Mick and Thommo had an eleven fish session in the Middilingbank arm recently. All fish were rainbows in excellent condition. Yellow Sunset Tassie was the best lure with nine of the fish taken using this colour on leadcore. Daphnea blooms on the sounder held the fish and they worked the area, known only as "spot X", hard and caught fish on every pass. Rapala trout patterns have been shining in the Cobrabald and Waiunui areas. Fished flatline and in close early in the mornings has accounted for some good rainbows. Not all have been large but enough around the 800gm to 1kg mark to keep anglers happy. Large minnows fished deep in the Anglers reach arm have produced some better quality browns. Though the numbers will never be great the chance of hooking a really monster of a fish is there. Seven to thirteen centimetre sized minnows are the go here. 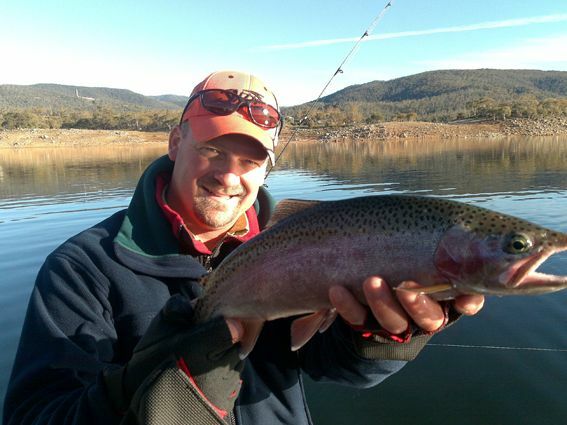 Jindabyne:- Has been fishing well with some one angler reporting some nice catches. *Mick, Adam, and Rowly had a good session on the lake recently with four well conditioned rainbows around the Islands and Tyrolean area. Yellow Sunset was again the gun colour with three of the fish on lead core. Other reports suggest the creel bay and waste point area is a good place to troll or spin. 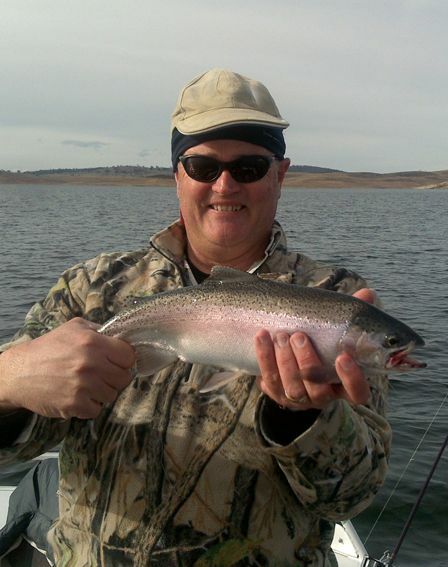 The bait fishing in Eucumbene has been very good with Powerbait taking some good catches. Grubs have come into their own now with the cooler weather. Rainbows are loving Powerbait and Scrubbies in the Buckenderra arm and also Seven Gates with many anglers catching their bags. Lime twist has been the popular favourite this week. Best locales to try continue to be Seven Gates, Buckenderra, Cobrabald, Wangrabelle, Homeleigh Bay and the Dam wall. In Jindabyne reports have been scarce again. Try areas like Rushes Bay, Hatchery Bay, The Clay pits, Curiosity rocks and Kalkite.